Robert Sadler (1909-2001) was born in Newmarket, Suffolk, the son of a racehorse trainer. By the age of fourteen he was drawing and painting aeroplanes, horses, houses and landscapes. After studying at Eastbourne College and Sidney Sussex College, Cambridge he joined the Royal Air Force in 1930 as a pilot from Cambridge University Air Squadron. In 1942, whilst posted to the Air Ministry as ‘Director of Plans’, he attended art school in London and spent the following year in Turkey on special duties where he lectured at the Turkish Air Staff College and painted and rode race horses. At the end of the war he returned to the UK and took up the post of Station Commander at RAF Binbrook in Lincolnshire. In 1947 he moved to Denmark as Air Attache to the British Embassy in Copenhagen where he attended art school and two years later, whilst Vice-President of the RAF Officers’ Selection Board, set-up a studio in Stockbridge whilst attending art school in Winchester. In 1953 he moved to the USA to take up the post as representative on the NATO Joint Chiefs of Staff Intelligence Committee during which period he attended the Corcoran School of Art in Washington DC where he first encountered the work of the American Abstract Expressionists. Returning to the U.K. in 1955 he moved back to Newmarket, having retired from the RAF ‘to devote the rest of my life to painting’. He attended Heatherley’s School of Fine Art in London, Cambridge Technical College and became a member of the Winchester Art Society and the Cambridge Society of Painters & Sculptors. 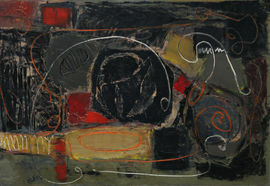 His first one-man show was at Swaffham Prior, Cambridge and from then until 1963 he lived and painted in a largely abstract expressionist style influenced by the Ecole de Paris Tachisme of Poliakoff and de Stael and by the contemporary British work of Peter Lanyon, William Scott, Paul Feiler, Bryan Wynter and Adrian Heath. This began a long and distinguished exhibiting career, his work being shown with The Royal Institute of Painters in Watercolours (1955), The Royal Institute Galleries Summer Salon (1955), The Royal Institute of Oil Painters (1955 and 1957), Heffers Gallery, Cambridge (1955, 1958 and 1964), the New Vision Centre Gallery (1957), the John Moores Liverpool Exhibition (1957/8), Bradford City Art Gallery (1959), the King Street Gallery, Cambridge (1959 and 1960), the Cambridge Society of Painters and Sculptors (1960 and 1961), the Obelisk Gallery, Washington DC (1960), Gainsborough House Society (1962), The London Group (1962), CEMA, Belfast (1962), Saffron Walden Festival (1962), the Argos Gallery, Aldeburgh (1963), and the Stable Gallery, Ufford (1964). In 1964 Sadler moved to Aldeburgh, Suffolk and built a new Studio at 39 The Terrace where he lived till his death in August, 2001. He showed at the Festival Gallery, Aldeburgh (1966), Royal Institute Gallery (1969), Framlingham Art Gallery (1974), Reades Gallery, Aldeburgh (1976), Tryon Gallery, North Carolina, USA (1979), Philip Francis Gallery, Sheffield (1984), EU Parliament, Strasbourg (1985/6), New English Art Club (1986), Saxmundham Music and Arts (1994), Aldeburgh 100 (1995), The Red Studio, Aldeburgh (1996). 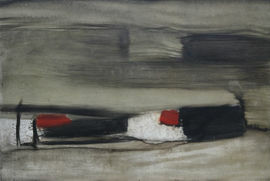 He hung an Annual Studio Exhibition almost every year between 1965 and 2001 and since his death Sadler’s works have been exhibited at various galleries throughout Suffolk. In 2007 a group of twelve of Sadler’s paintings was chosen to furnish the set for the Cornwall based TV series, ‘Echo Beach’. In his foreword to the catalogue of Bryan Wynter’s one man show at the Hayward Gallery in 1976 Alan Bowness wrote, ‘For a short period – say from 1955 to 1965 – British artists really believed they were as good as anyone and, objectively speaking, I think this was true – certainly one saw the emergence of a remarkable plethora of new talent and a quantity of good painting and sculpture unmatched before or since.’ Robert Sadler, and the work he created during this decade, perfectly illustrate Bowness’s point and fully deserve to be seen in that same light.